Don Youngblood was a champion bodybuilder, but more importantly a devoted husband, father and grandfather... he will be missed. After 14 years of building his business, at age 34 Don Youngblood decided to allow himself some time to pursue a personnel hobby. He chose bodybuilding and took to it like a duck to water. At an age when most Pro&apos;s are winding up their careers, Don was just beginning. In 1994 he won the Arkansas State Masters Bodybuilding Championship. In 1995 he won the Arkansas State Overall Bodybuilding Championship, then in August of 1995 he won the NPC Masters National Overall Bodybuilding Championship, were he received his Pro Status. In 2001 he placed 2nd in the IFBB Masters Mr. Olympia being defeated by only 2 points. Don was 8 points ahead after beating Vince Taylor in the symmetry and muscularity round. Don was edged out in the posing round of competition by a narrow 2-point margin. The 2001 Masters Olympia was Don&apos;s first ever-professional competition. Read his full profile here. Sorry to report that DON YOUNGBLOOD has passed away in his home, apparently the cause of death being a massive heart attack. 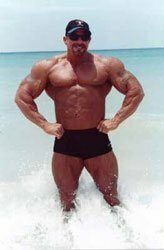 Don stunned the bodybuilding world by beating the previously "unbeatable" Vince Taylor at the 2002 Masters O. Don went on to fulfill his lifelong dream of competing in that year&apos;s Mr. Olympia later that same year. Don just celebrated his 51st birthday April 7, and ran a very successful trucking business in his home state of Arkansas with his wife and children. On behalf of all the IFBB pros, I wish to express our deepest sympathies to the Youngblood family. Don was a champion bodybuilder, but more importantly a devoted husband, father and grandfather... he will be missed. Celebrate Don&apos;s life by visiting his website at www.donyoungblood.com. Don Garfield Youngblood was born on April 7, 1954, in Bakersfield, California. He was married to a wonderful person named Sue, and had four children (Christy passed away at age 11). Don was an enormous inspiration to many who say what can be accomplished when you set your mind to something, and also for his deep respect to others and to his family. I was stunned and saddened to hear about Don, my condolences go out to his family and friends. I interviewed Don a few years back, here is the Don Youngblood Interview where you can learn more about Don. Don was a humble caring person whose work on Earth was complete and his life in heaven has begun. We should all be so lucky to be called home from a world that is not own final destination. Don became a bodybuilder late in life and his personal goal was to become a professional. He did that while winning the Master&apos;s Mr. O and stepping onstage at the Mr. Olympia the same year he won the Master&apos;s! Rest in Peace Don, our condolences to the Youngblood family. Every man dies, not every man lives! Don was blessed with a loving family and children who will carry on his name and memories. Rest in peace my friend. Find out what other people think about this on our messege boards.